If you find it impossible not to finish a bag of chips, it’s not the potatoes that are demolishing your impulse control. It happens with pretzels, bacon, popcorn, and countless other foods that keep us reaching for one more bite. Blame salt, the mineral that human brains are hardwired to crave. No other ingredient has a greater impact on the taste of food. Salt balances sweetness, minimizes bitterness, and releases aromatic compounds important to the perception of flavors. Without it, our food would be much less interesting. But there are reasons to reach for salt other than to season your soup. This essential mineral is vital to our survival. Almost every basic biological function, from digestion and blood production to muscle movement, nerve transmission, hormone balance, the delivery of nutrients, and more, depends in part on salt. But when sodium levels swing too far in either direction, our bodies struggle to even things out. That task that can exhaust and damage organs and take a toll on our overall health. Too little salt can lead to muscle spasms, cramps, nausea, fatigue, and brain fog, while an excess of sodium may cause lethargy, confusion, abnormal speech, irritability, and sometimes seizures. When sodium levels rise, our bodies produce a hormone that helps us retain more fluid, increasing the volume of blood, which in turn increases blood pressure. Subtle and temporary changes in blood volume to balance sodium levels are healthy and normal. But when this becomes an ongoing process of continual increases in blood volume to compensate for high sodium levels, high blood pressure (hypertension), and other chronic conditions, such as cardiovascular disease, become a concern. The 2015-2020 Dietary Guidelines for Americans recommend keeping sodium intake from dietary sources to less than 2400 mg of sodium per day. In real-world terms that equates to about one teaspoon of salt per day. It’s no surprise that as a population we are surpassing this daily limit. The average American consumes more than 3400 mg of sodium per day, which can increase blood pressure, a major risk factor for the nation’s #1 and #5 leading causes of death, heart disease and stroke, respectively. DIY your dinner. More than 70 percent of our salt intake comes from processed food. By eating whole foods and preparing your own meals, you immediately become the driver of your own health and gain control of how much salt you consume. Get schooled. 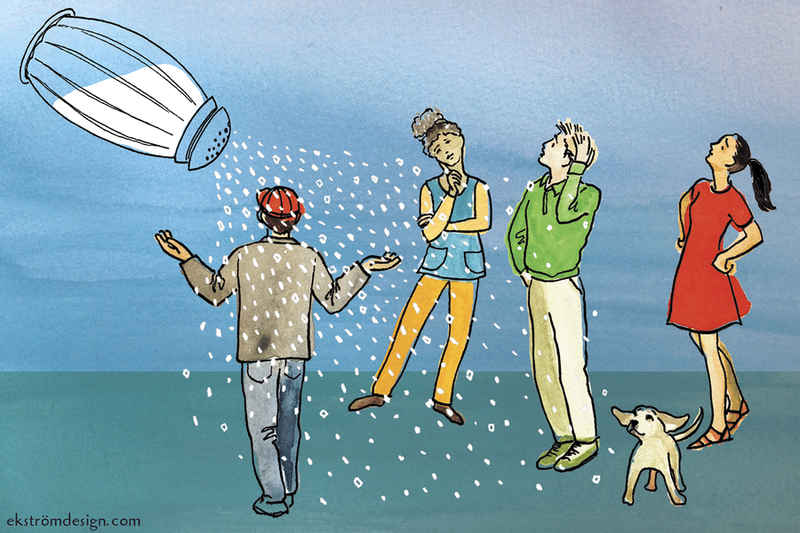 Educate yourself on some of the biggest culprits of hidden salt. Bread products, cured and processed meats, cheese, canned products like soup and tomato sauce, crunchy favorites like chips and pretzels and popcorn, frozen meals, and meals prepared at restaurants are all likely to contain high amounts of salt. Go low. Opt for low-sodium and no-salt-added broths, sauces, and spice and seasoning blends. Pro Tip: At Sun Basket, we try to keep sodium to 800 mg per serving or less, about one-third of the daily value. Choose from our Lean & Clean meal plan, where sodium is guaranteed to be below this 800 mg limit, or try our Heart-Check Certified recipes, which meet the American Heart Association’s guidelines, clocking in at 600 mg of sodium or less per serving. Read the Nutrition Facts panel. Sodium is presented in mg per serving, and is also accompanied by a percentage called the “Daily Value%.” Use this as a guide, ideally keeping total sodium consumption to less than 100 percent. Alternatively, look for products that have a <1:1 ratio of sodium to calories per serving. For example, if one serving of popcorn is 150 calories, an ideal sodium level would be less than 150 mg sodium per serving. Look beyond the shaker. Seasonings such as anchovies, capers, miso, tamari, soy sauce, fish sauce, and Worcestershire sauce are all high in sodium. That doesn’t mean you shouldn’t enjoy these foods, but you will want to season accordingly. You can often use a lighter hand when adding these salty ingredients. Take ownership of your health. Studies have found that a reduction in blood pressure can be achieved in just three weeks of reducing your sodium intake, without the side effects of most blood pressure lowering drugs. Even better, statistics project that a reduction of 400 mg in average sodium consumption across the population could prevent up to 28,000 deaths and save nearly $7 billion annually in health care expenditures.